The Maevex 6150 multi-channel enterprise encoder appliance delivers the full feature set of the Maevex 6100 card in a convenient, rack-ready form factor with added I/O for audio and USB connections. Maevex 6150 simultaneously delivers content to cloud-based servers to reach internet viewers, pushes many streams over LAN for local viewers, and records to local or network storage for later editing and viewing. Paired with Maevex PowerStream Plus software, Maevex enables high-density content distribution ecosystems on standard 1 GigE networks—at low, user-defined bitrates. Zero-latency pass-through for real-time simultaneous output of AV content. Plug-and-play functionality for complete system independence. Rack-mountable appliances to build multi-channel AV-over-IP installations to encode/decode/stream. 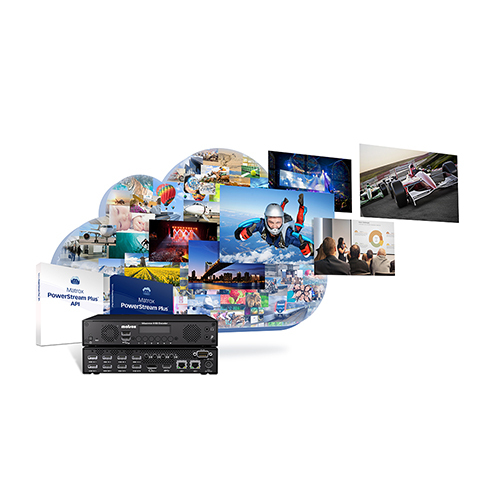 Discover devices, manage content, access hardware, and monitor all streams and recordings using Maevex PowerStream Plus software. 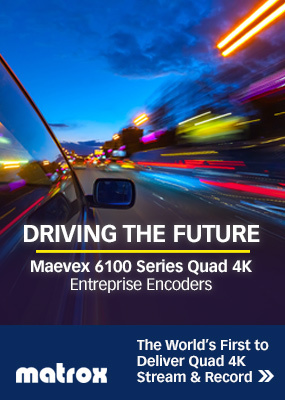 First in the world to deliver quad 4K input capture and encode, the Maevex 6100 multi-channel enterprise encoder card simultaneously delivers content to cloud-based servers to reach internet viewers, pushes many streams over LAN for local viewers, and records to local or network storage for later editing and viewing. Paired with Maevex PowerStream Plus software, Maevex 6100 enables high-density content distribution ecosystems over standard 1 GigE networks—at low, user-defined bitrates—ideal for corporate communications, digital signage, education, military, government, control rooms, and more. H.264 solution fits seamlessly into existing infrastructures and interoperates with virtually any network device. PC independence via a native network jack. Optimize file sizes to balance quality and bandwidth demands. Combine cards to build multi-channel AV-over-IP installations to encode/decode/stream. Stream or record high-quality audio and video over a standard IP network, thanks to the Maevex 5100 encoder. 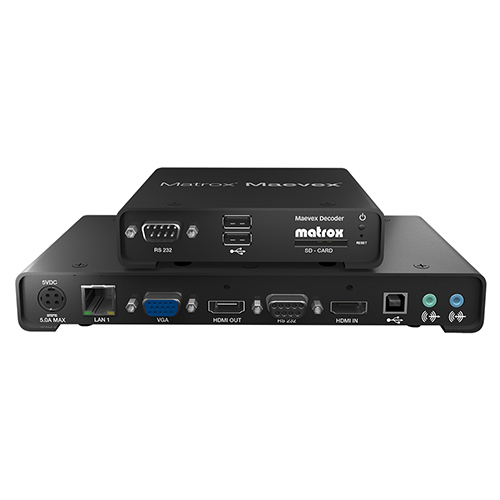 The Maevex 5100 functions as a standalone encoder; it also works as part of a larger AV ecosystem, streaming to Maevex decoders or any H.264 device, as well as recording to a shared network or NAS drive. The Maevex 5100 encoder is a cost-effective solution for environments that demand reliable AV-over-IP communications including enterprise, digital signage, education, military, government, control rooms, and more. Scale streams prior to local or cloud-based distribution for lower bandwidth consumption.  Interoperates with third-party hardware and software. Local real-time pass-through and confidence preview options. Support for wide-screen and standard-aspect resolutions. 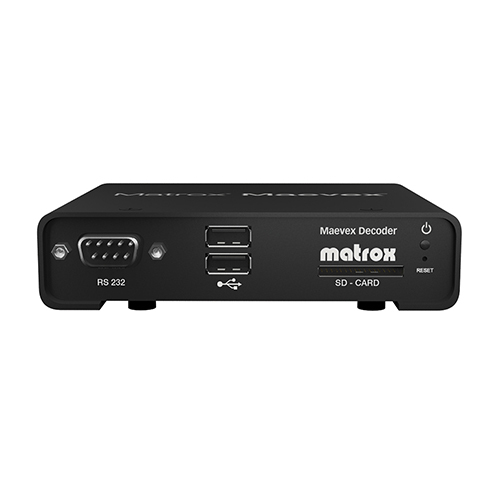 The Maevex 5100 decoder provides exceptional-quality Full HD decoding over standard 1 GigE networks. Built on H.264, this standalone Maevex 5100 decoder interoperates with virtually any network device, ensuring high-density content distribution and system scalability. Coupled with Maevex 5100 Series and Maevex 6100 Series encoders, the Maevex 5100 decoder offers a cost-efficient AV-over-IP solution for markets that demand ease-of-use and reliability, including enterprise, digital signage, education, military, government, control rooms, and more. Daisy-chain decoders to extend network capacity. Play back pre-recorded content at the decoder in case of a network disruption (e.g., loss of power). Balance bitrate and quality demands by scaling content up or down. 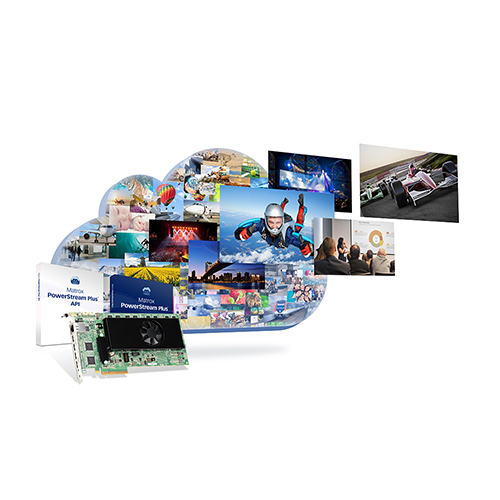 Matrox C900 is the world’s first single-slot graphics card to drive nine displays for 3×3 and 9×1 configurations. 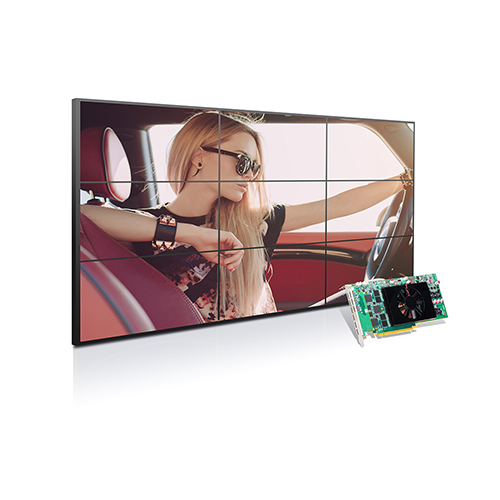 This plug-and-play card powers nine, six, or three displays, and runs in stretched desktop mode to deliver an ultra-large surface across all attached displays. C900 is ideal for digital signage, AV presentation, security, control rooms, and more. 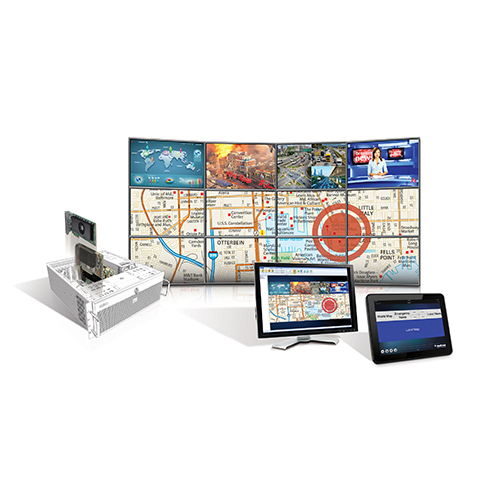 Power multiple screens from a single card for simple, scalable video walls. Consume minimal power while delivering high-density display configurations. Deliver smooth video playback and exceptional graphics performance. Combine two cards to drive 18-monitor video wall arrays. Pair with Matrox PowerDesk desktop management software and/or Matrox MuraControl video wall management software. Matrox Mura-based video wall controllers provide market-leading, multi-channel IP encode, IP decode, and physical capture all from one system. These platforms boast the industry’s highest-density/smallest-footprint systems, capable of fulfilling the most demanding video wall requirements. Whether small-, medium-, or large-scale, Mura-based controllers deliver an unprecedented range of functionality and flexibility, making them ideal for control rooms, digital signage, AV presentation, security, traffic management, and more. High-reliability platforms designed for 24/7/365 operations. Fully scalable to fit any video wall configuration (56 inputs, 56 outputs, and many more IP streams). Easy-to-use Matrox MuraControl video wall management software. Flexible integration with leading control systems, including Crestron and AMX. World-class technical assistance and engineering teams for the best support in the industry.